I’d like to talk now about HER2 mutation-positive non-small cell lung cancer. HER2 has actually been around for a while — most patients are familiar with this in the breast cancer field. HER2 is overexpressed, or a lot of it is expressed, in a subgroup of patients with breast cancer, and this is important because there are treatments against HER2 like Herceptin, which have improved the survival of breast cancer patients who have high levels of HER2 expression. This has also been tried in lung cancer because HER2 expression can be high in lung cancer as well. Unfortunately, the HER2 inhibitors like Herceptin have not been effective in lung cancer patients, historically. What’s changed recently has been the understanding that a small group of lung adenocarcinoma patients, probably about 2%, will have an activating mutation in HER2, very similar to what’s seen in EGFR mutation-positive non-small cell lung cancer, but in HER2 instead. This is a real driver mutation and from other driver mutations like EGFR mutations, we know that inhibiting that driver can be very effective in treating patients. The problem with this is it’s so new that there really haven’t been any clinical trials that tell us what the best treatment is for HER2 mutation-positive lung cancer, or how long you would expect this to last. There have been case reports of people treated with HER2 inhibitors such as Gilotrif or afatinib, which, while it’s approved for EGFR mutation-positive lung cancer, also inhibits HER2. We know that some patients have responded for some period of time to these drugs. We also have heard reports that Herceptin, usually used in combination with chemotherapy, can benefit some patients with HER2 mutation-positive non-small cell lung cancer, but there really isn’t enough evidence in 2015 to make a definitive recommendation of one or another of these drugs in this setting. So if you have a tumor and they’ve identified an activating HER2 mutation in the cancer, the first choice I would recommend is participation in a clinical trial. One of the arms of what’s known as the National Cancer Institute’s MATCH trial includes all patients of all types of cancer that have derangements in HER2, including HER2 mutations, to treat patients specifically with a HER2 inhibitor. This would be, probably, my first choice for a HER2 positive patient, but if a trial isn’t available, or you’re not eligible for some other reason, talk to your doctor about perhaps trying off-label, either Gilotrif or Herceptin, in combination with chemotherapy. While there isn’t a recommendation about one or the other, both might be effective, and after discussion with your doctor, one might be an option for you. Although, I would reserve this for after exhausting traditional methods such as chemotherapy and immune therapy. 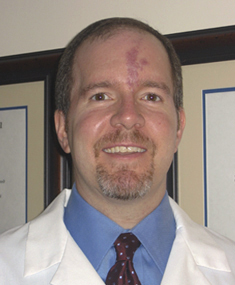 Dr. Nathan Pennell received his Ph.D. in neuroscience in 1998 and his M.D. in 2002 from the University of Florida College of Medicine in Gainesville, FL. He then moved to Boston to do his internal medicine internship and residency training at Brigham & Women’s Hospital, and completed his medical oncology fellowship at the Dana Farber Cancer Institute, also in Boston. While there, he developed an expertise in lung cancer, mesothelioma, and thyroid cancer. He moved to the friendly midwest in 2008 to continue with this focus at the Taussig Cancer Institute at the Cleveland Clinic.